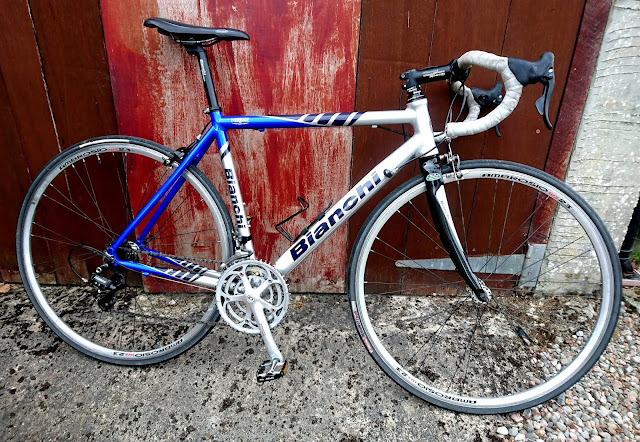 It's been nearly 10 years since my Bianchi road bike has seen any tarmac. The speed machine has been 'moth balled' for a long time. My wife is in training for two tri-athlons so a good excuse to get my bike on the road to help with her training. Amazing my beautiful Bianchi antique was in superb running order after some tlc. A few cobwebs and a drop of oil was all that was required for it's return to the road. Karen and I had a brilliant day, riding 103km and 800m of climbing. A Tour of the Cairngorms ! We took a route through some quiet roads and finished up at the Coire Cas carpark on Cairngorm. Well we finished at the house of course. I could well get into road biking again. I used to Cycle a lot around the Killin area where I lived a while back. Strathspey has some fine roads to explore too. Problem is the Cairngorms has some superb mountain biking of course.